If you want IMDB information about the VOD and series, you should do the IMDB assignment. Since version 2.6.2 you can add the IMDB information on VOD and series. Perfect Player can display this information. The editor generates a specific download link for the Perfect Player. This supports the CatchUp (TV Archive) service of Xtream Codes. 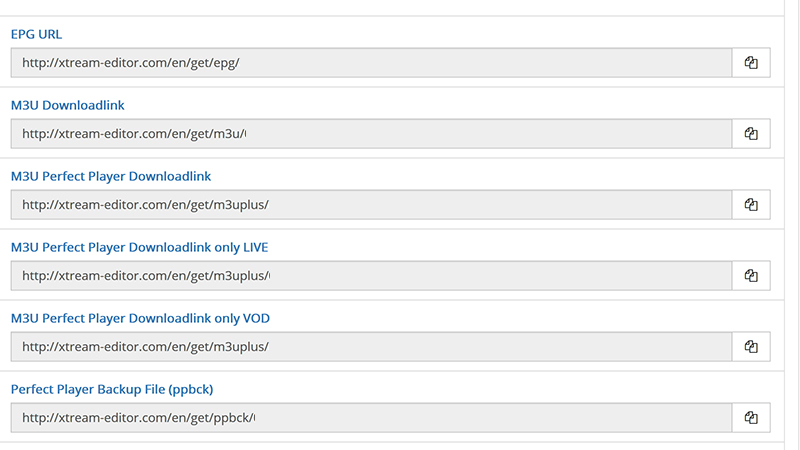 If you want VOD and LIVE channels separately, you can enter 2 separate links in the Perfect Player. The VOD are then displayed in a different (better) panel with IMDB information. There you can enter different playlist URL. In the first "Playlist 1" you can enter the IPTV Link and in "Playlist 2" the VOD Link. 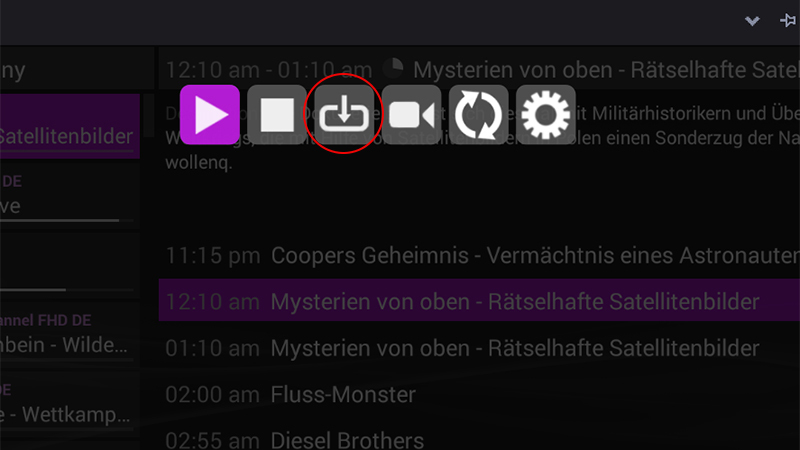 In the VOD playlist you should choose the option "VOD". You can enter the EPG link under "EPG 1". Our EPG data always has the UTC time zone. If necessary, you can set the "Shift". The links to the Perfect Player can be found in the Standard Editor by clicking on the INFO icon and in the PRO version in the Edit Panel of the Line. To load the backup file, go to Settings->Defaults->Restore settings. Select the file from the Xtream Editor (previously downloaded to the device). We recommend a backup of the settings before importing the our backup file. Select "Archive" in the menu. There you will get a list of shows in the past. Perfect Player must first collect the data to make it available there. 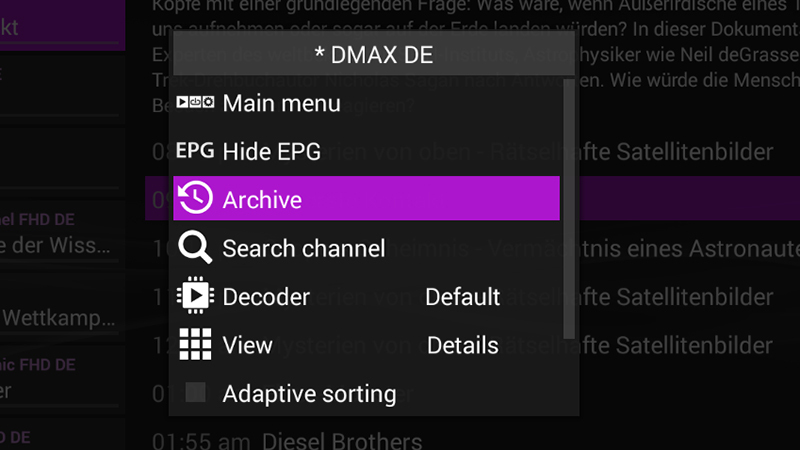 If you have a time difference with the recordings from the provider, you can set in our line the "EPG TimeShift". 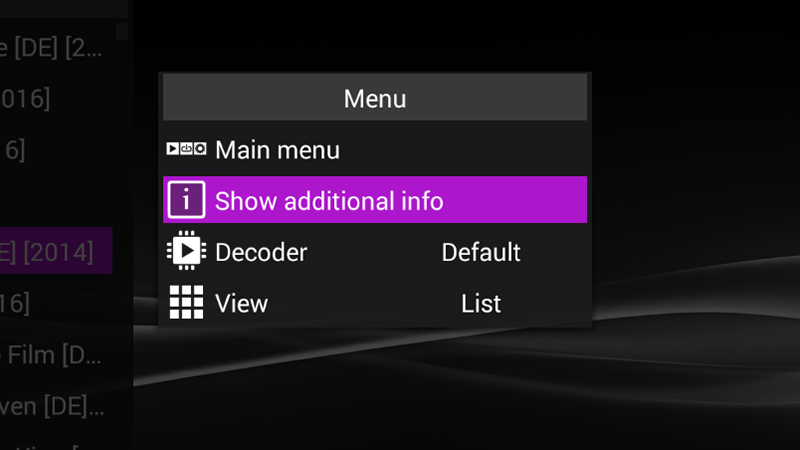 This parameter is not used in the Perfect Player for the EPG data. Therefore we use this setting for the catchup shift. In Perfect Player you have different sources. IPTV, Files and VOD. Select sources in the menu and then VOD.To get the IMDB information, you have to turn on the option "Show additional info"